Marc Haendle at Ocean Independence in Spain just called to say he's taken over the central listing of the 42m flybridge sailing yacht Passe Partout with a €500,000 price reduction. A pedigree superyacht, she was built by Holland’s Jongert yard in 2001 to a Tony Castro design. Most recently refitted in 2009, she is Lloyds classed and sleeps up to nine guests in a master, double and two twin cabins plus three Pullman berths. Passe Partout comes with an array of extras for active watersports enthusiasts, including a dive compressor and has a folding keel. 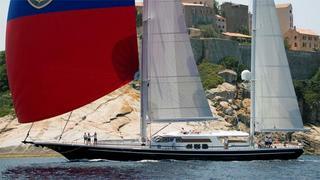 At her cruising speed of 10 knots, Passe Partout has a range of 4,200 miles and is now asking €9.25 million, VAT paid.